Chiari Malformations (CMs) are structural deficits in your brain’s cerebellum, which controls your balance? CMs may develop when the indented bony space at the lower rear of your skull is smaller than normal, which causes the cerebellum and brain stem to be pushed downward? The resulting pressure may affect functions controlled by this area and block the flow of cerebrospinal fluid (CSF) to and from your brain? After a vehicle accident, you’re ten times more likely to have Chiari Malformations? 95% of patients actually experience at least five symptoms of CMs? According to research by the National Institute of Neurological Disorders and Stroke, there are a variety of symptoms of CMs. But lately, I’ve been discovering that some of my patients at Sheehan Chiropractic who are complaining of headaches, neck aches, balance problems, muscle weakness, numbness, dizziness, vision problems, hearing loss, vomiting, insomnia, depression, and other symptoms, actually have CM. Some patients even have been affected with a decline of their fine motor skills or hand coordination. That’s why I always ask them if they’ve been in a recent accident that could have triggered the symptoms. As with many medical conditions, these symptoms may change for some people, depending on how much buildup there is of CSF and how much pressure it exerts on the brain tissues and nerves. Some people may exhibit no symptoms, but have a Type 1 CM, while others may have no symptoms now, but may develop some signs of the disorder later in their lives. Infants may have a plethora of symptoms of CMs, including – but not limited to – difficulty swallowing, an irritability while being fed, drooling excessively, gagging or vomiting, arm weakness, stiff necks, an inability to gain weight, developmental delays, or a weak cry. As with its variety of symptoms, primary or congenital CM can be caused by structural defects in your brain and spinal cord that may occur during fetal development by genetic mutations or by a lack of proper vitamins and nutrients in their mother’s diet. Primary CM is much more common than acquired or secondary CM, which can be caused later in your life if your spinal fluid is drained excessively from your lumbar or thoracic areas due to an injury, by exposure to harmful substances, or by infection. 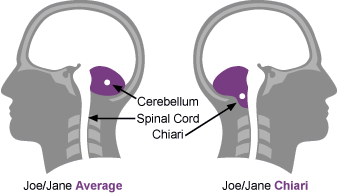 Want More Information About Chiari Malformations? For more information, call Dr. Laura Sheehan at (415) 681-1031 to make an appointment at our office at 655 Redwood Highway, Suite 160 South Building in Mill Valley or at 915 Irving Street in San Francisco.